The 8x8 HDMI/ HDBaseT Matrix with simultaneous CAT5e/6/7 and HDMI outputs connects 8 HDMI sources to 8 displays. 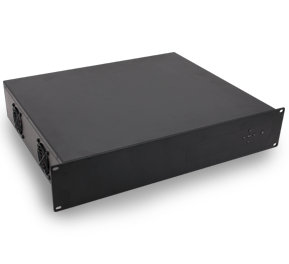 This matrix features 8 outputs contained 2 local HDMI outputs and 6 HDBaseT outputs. It supports the transmission of video (resolutions up to 4K@60Hz 4:4:4 8 bit) and supports high resolution digital audio formats such as LPCM 7.1CH, Dolby TrueHD, Dolby Digital Plus and DTS-HD Master Audio. It works with Blu-Ray players, Set-Top boxes, Home Theater PCs, and game consoles. This device supports all HDMI 3D formats. Connect HDBaseT Receivers to each of the CAT-Cable outputs to extend the HDMI signal up to 328ft/100m for multi-room connectivity. The matrix can be easily controlled via the front panel button, IR, RS-232 and TCP/IP.